Rubies are the fiery red gemstones that traditionally are known as the birthstone of July. The ruby is a variety of corundum. Other colors of corundum are classified as sapphires. The ruby was synthesized by the Verneuil process in 1902, and since that time many rubies that appear in the marketplace are synthetic. 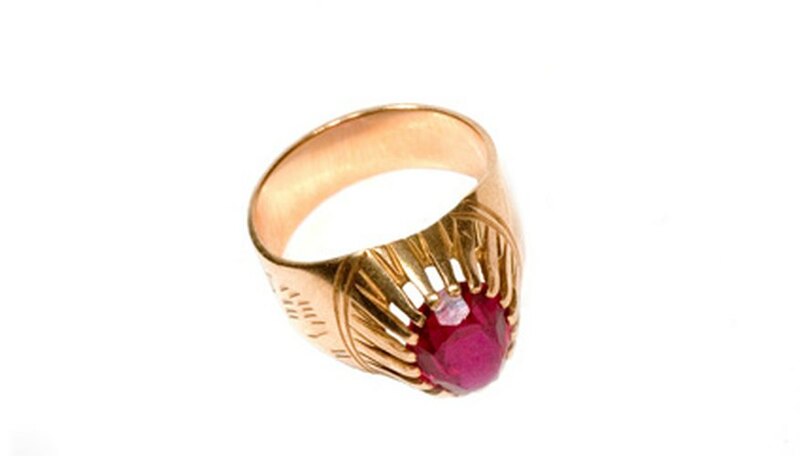 To determine whether the ruby you want to purchase is synthetic or natural, consult with an expert. Look at the color of the stone. The widely accepted norm is that the ruby should be a medium to medium dark red color. Lighter stones are classified as pink sapphires. Examine the transparency of the stone. In order to be considered of gem quality, a ruby must be transparent. Opaque rubies hold little value. Find out the country of origin of the ruby. In general, Burmese rubies command the top prices. Sometimes the color can provide a clue to the origin of the stone, with Burmese rubies tending to be a purplish red color, while Thai rubies can appear more brownish red. Ask if the ruby has been treated in any way. A common enhancement is high temperature heating and controlled cooling to clarify the stone and improve color. Heating should be disclosed, although it does not necessarily detract from the value of the gem the way that diffusion coloring and glass filling does. Determine the cut of the ruby. Brilliant and step cuts add the most value. Establish the size of the stone. A large ruby will command a greater price, although even smaller gem quality stones will have a high value because of the scarcity of the stone. Consult The Standard Catalog of Gem Values, 2nd. Ed., Anna M. Miller and John Sinkankas, for wholesale prices of faceted gem rubies. Pricing takes into consideration origin, color, size and clarity, from $100 to $15,000 per carat. Have the ruby appraised by a reputable dealer. Today’s enhancements appear close to natural elements of the ruby, and it takes a highly skilled gemologist to spot a man-made stone. More complex synthesis processes have been developed in recent years. These so closely simulate natural formation conditions that colors and even inclusions look extremely natural and such stones are difficult for all but the most highly skilled professionals to identify as man-made. In an attempt to obtain a higher price, some unscrupulous vendors will assign a misleading label to stones that are in fact something else, such as labeling a pink topaz as a Brazilian ruby or a garnet as a garnet ruby.